Virtual reality headsets can make us see and hear things in another world, but they lack the sensations of taste, smell and touch. 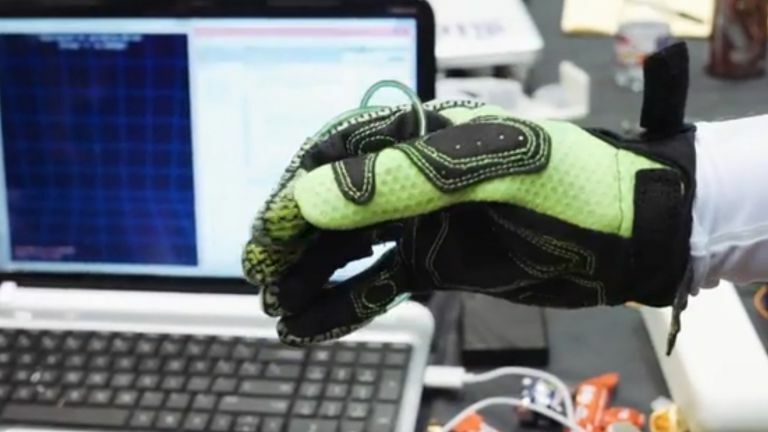 This glove throws touch into the mix, taking us one step closer to total immersion. Slip it on, and you'll be able to feel objects in the virtual environment. It does this with force feedback in the fingertips, and by using air to inflate bladders underneath your fingers. Pick up a sword in the game, and you'll feel it in the hand. It's wireless, so you don't have to worry about getting yourself tangled. It's only right-handed at the moment, but it's still in the research phase, so we could see a left-handed version or even a pair for gaming. It's made by students at Rice University in Houston, Texas. The tech is still under wraps at the moment, so we don't know exactly how it works. But if it works as advertised, it could add a whole new dimension to virtual reality games. Virtuix – a Houston-based firm behind the Omni VR treadmill – has sponsored the glove, so hopefully it'll go into production before too long. Along with the treadmill, it could be the start of a whole new market of virtual reality accessories. The only bad news is that Oculus Rift, the most eagerly awaited of all the virtual reality headsets, is highly unlikely to launch this year. While previously slated for a 2015 release, an exec from Facebook – which bought Oculus VR – cast doubt on that in a recent quarterly earnings call to investors. Still, with a VR treadmill and gloves to go with it, it'll be worth the wait. If someone gets started on VR smells and tastes, we'll be laughing.